Straightforward biopics are not generally my favourite genre. Even with cradle to the grave movies, we only ever see little snippets of someone’s life – usually the dramatic, life-changing moments. I think it’s akin to peeking through a keyhole with a telescope, where you can only see a very limited view through the lens of the filmmaker’s vision. With an extraordinary character such as Sidonie-Gabrielle Colette, who actively wrote and rewrote her own history throughout her long life, there are bound to be contradictions and conflicts. So, I went with a girlfriend to see Colette (a writer I haven’t read since my 20s) with a certain amount of healthy trepidation. I’m pleased to say my fears were allayed very quickly and I’ve determined I must reread at least The Vagabond again this year. Director Wash Westmoreland (Still Alice 2014) wisely concentrated only on Colette’s early life, through the Belle Epoque until she leaves her first husband, delivering a sumptuous film that is full of tiny visual details that delight and enhance this ultimately uplifting story of female empowerment and independence. Apparently, this project became something of a labour of love that Westmoreland began with his late husband, Richard Glatzer some years ago. Fittingly, the film is dedicated to Glatzer and he is credited as co-writer with Westmoreland and Rachel Lenkiewicz (Disobedience 2018). It is of course, heavily condensed but through the lens of the 21st century, is a triumphant story of one woman’s battle to live her life on her terms. Small things abound that capture the eye. The set decoration by Lisa Chugg and Nora Talmaier provides fine period detail of furniture, everyday items and art nouveau decoration and the glorious costumes by Andrea Flesch and their handmade finishing touches are fabulous. I also appreciated the cinematography of Giles Nuttgens with the subtle lighting and colour differences between the countryside and Paris. 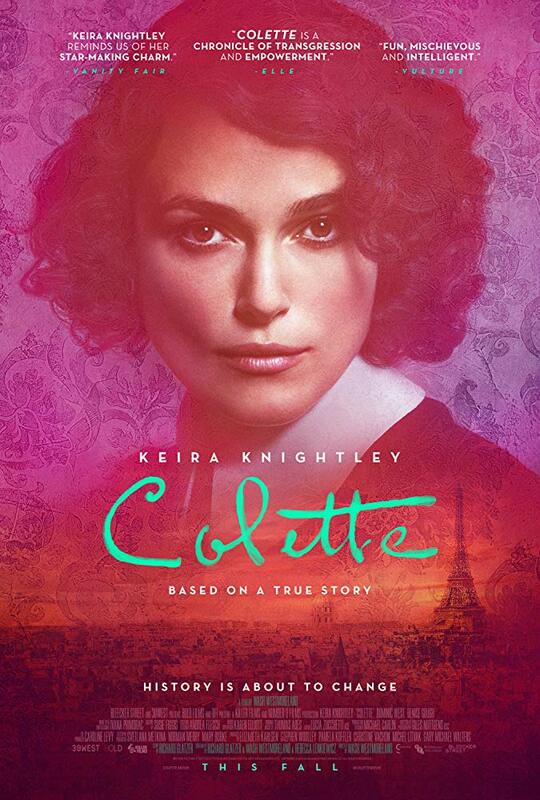 A superb star turn by Keira Knightley is a fine reminder of how much she can do with a good script and direction, taking Colette from a schoolgirl in Burgundy to a style-maker in Paris. But she is surrounded by a uniformly excellent supporting cast, including Fiona Shaw and Robert Pugh as her parents, Denise Gough as the wonderful Missy and Dominic West as the dashing and domineering libertine, Willy. West is utterly delightful as the pompous and caddish literary entrepreneur and plays it to the hilt. But ultimately, this is Knightley’s film and – like The Favourite – another timely reminder that audiences are keen to see women’s stories.